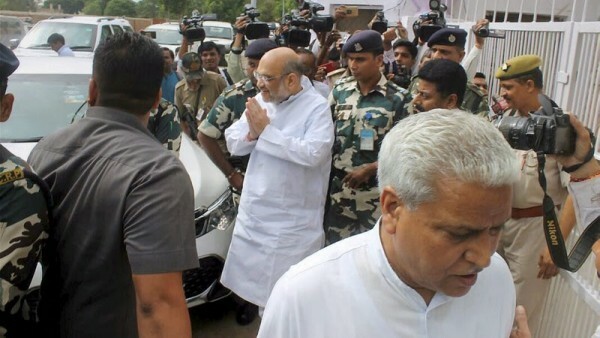 Ram Lal in the foreground with Amit Shah bringing up the back. As Lok Sabha elections draw near, the post of "Sangathan Mahamantri" (General Secretaries-Organisation) becomes increasingly important in the BJP. The incumbent is a key political link with the party's ideological mentor RSS and carries out coordination at various levels. While other party office-bearers, including the party president, vice-presidents, general secretaries, secretaries and spokespersons have a public profile and engage with the media, the General Secretary (Organisation) is largely a backroom commander dedicated to party work — identifies organisational gaps, gives grassroots feedback and stays away from the limelight. The post in the past has been held by leaders like Sundar Singh Bhandari, K. N. Govindacharya, Prime Minister Narendra Modi and Sanjay Joshi. The significance of the post can be understood from an instance. When controversy broke out in 2004 over BJP leader L.K. Advani’s remarks on M.A. Jinnah, the RSS exerted pressure on him to resign. But he was adamant. Ram Lal is considered rooted to the ground, takes organisational meetings routinely, gives feedback to top party leaders and inform the state units about the party’s various programmes. V. Satish: He is “Sangathan Mantri” (Joint General Secretary (Organisation)) and in-charge of the west zone (Rajasthan, Gujarat, Maharashtra) besides Andhra Pradesh. B.L. Santhosh: A chemical engineering graduate, Santhosh is looking after BJP affairs in south India. Known for organisational skills, he adopts the latest communication technologies for increasing the party’s strength. The initiative of getting volunteers from various professions to take a sabbatical and work for the party, prior to the 2014 Lok Sabha elections, was said to be his brainchild. Santhosh hails from Shivamogga in Karnataka and apparently has not the best of equations with party veteran B.S. Yeddyurappa. He played a key role in the backroom operations in the 2008 assembly polls when the BJP came to power in the state.